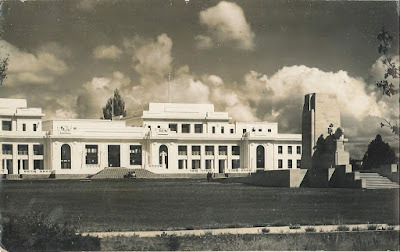 When is a fairly common postcard of Old Parliament House really a portal into migration history, family alliances, daring tales of wartime escapes, Prime Ministers, political ambition and pioneering social justice campaigns? When the staff at the ACT Heritage Library get their deerstalkers on and start following leads. The ACT Heritage Library is fortunate to receive many donations that help illustrate the rich history of the Canberra region. Sometimes donated material requires a little extra digging before it reveals its true worth. One recent example is a postcard of Old Parliament House which came to us in an envelope with few details beyond what was on the card itself. As it is important to place items in their context, we put on our deerstalkers and began the hunt. We focused first on the image itself; looking for clues about the photographer and the time period the photograph was taken. Cross-referencing it with an item in our collection established that the image was taken by R.C. Strangman, a well known Canberra photographer whose work was frequently sold as postcards. Given that the statue of King George V was in front of Old Parliament House (it was later moved to the side), suggested that the photograph was perhaps taken sometime in the 1950s. While we now had an artist and an approximate date, we did not stop there. The postcard had more to tell us. Most interesting, was the message that had been written on the reverse of the postcard. The style of writing provided a snapshot of language at the time; there was a fond reference to ‘Comrade Ashkanasy,’ the same last name that was on the envelope's rather indistinct return address. Thankfully, the name is not a common one. We were able to locate and contact the donors, to get both further information and their formal consent to obtain ownership of the material. trip to date and enjoying it very much. fire & right alongside the tea buffet for him. The donors turned out to be the son and daughter-in-law of Maurice Ashkanasy, a prominant Jewish community leader and barrister from Melbourne. 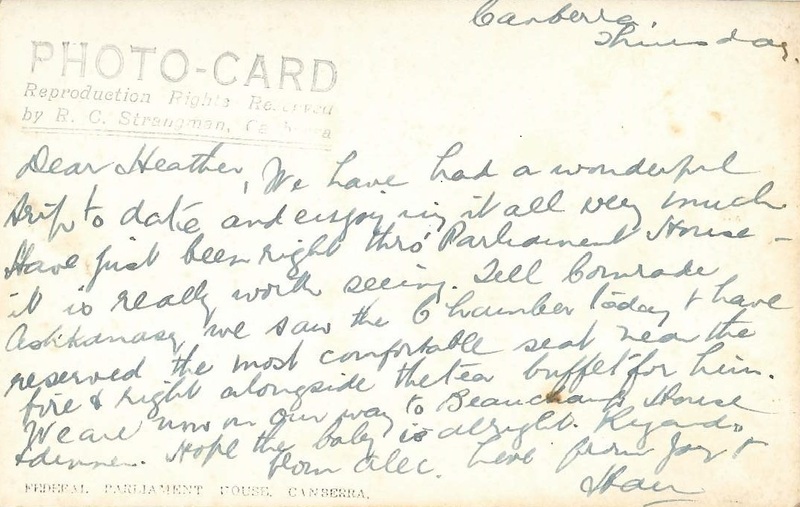 The postcard was sent to Maurice’s wife, Heather, from Alec Breckler, whose family owned the shoe company Betts Group (formerly Betts and Betts). Joy and Han were Alec's wife and daughter. The reference to the Ashkanasy baby towards the end of the correspondence was a stepping stone to providing a clearer date for the postcard. Our initial date of mid-1950s proved incorrect. Research showed the youngest Ashkanasy baby, Neal, was born in 1945. So the photograph had to have been taken in 1945 or earlier. So at this point we have successfully solved much that was mysterious about this item. All the important features and persons have been identified. While Alec joked about ‘reserving the most comfortable seat’ for Maurice in Parliament House, Maurice was unsuccessful when he ran for Labor in both the 1946 and 1958 elections, and neither he nor Alec ever lived in the Canberra region. However, their influence can certainly be seen across our city. Maurice has a street named after him in Evatt, and a bust at the National Portrait Gallery. Alec’s family’s stores are scattered across Canberra. Ex-Governor-General and Canberra Citizen of the Year, Sir Zelman Cowen also wrote about the significance of Maurice’s life in the Australian Dictionary of Biography. The postcard is symbolic of how one small, seemingly insignificant item can provide a network of discoveries. 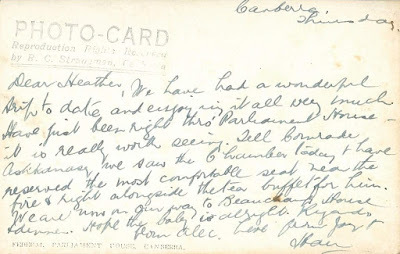 Want to know what other connections this postcard has made including a daring escape from Singapore as it fell to the Japanese in World War 2? Browse the Ashkanasy Postcard finding aid in our Manuscripts Collection.